There is an infrastructure problem, if not a crisis, in the United States, but public opinion may not yet be in a position to back funding measures to solve it. That was the message Sen. Roger Wicker, R-Miss., chairman of the Senate Committee on Commerce, Science, and Transportation, shared at the American Association of State Highway and Transportation Officials 2019 Washington Briefing on Feb. 28. 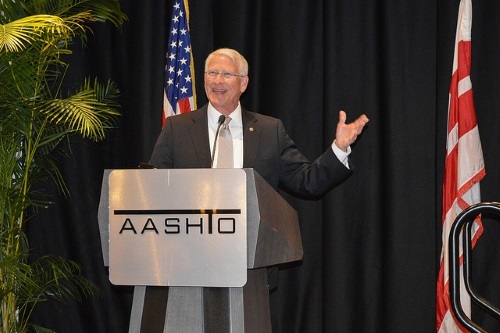 “I would love to see an infrastructure bill passed but the sad truth is … it costs money to build infrastructure,” Sen. Wicker explained as the keynote speaker for a joint luncheon sponsored by AASHTO and The Road Gang at the Washington Briefing. He said that “we have to invest in our assets” but emphasized that “he doesn’t know” if using public private partnerships or P3s “is a winner in the heartland” of the United States. Sen. Wicker also noted that Sen. Mitch McConnell, R-Ky., the Senate’s majority leader, is “determined” to bring the Green New Deal to a vote and to do it soon. Sen. Wicker also touched on what he sees as a need to promote the development of 5G communications technology, especially as it may be key to the successful deployment of autonomous vehicles.